Perfect Surfaces is Canada’s leading supplier of high-quality recycled rubber flooring and specialty products. 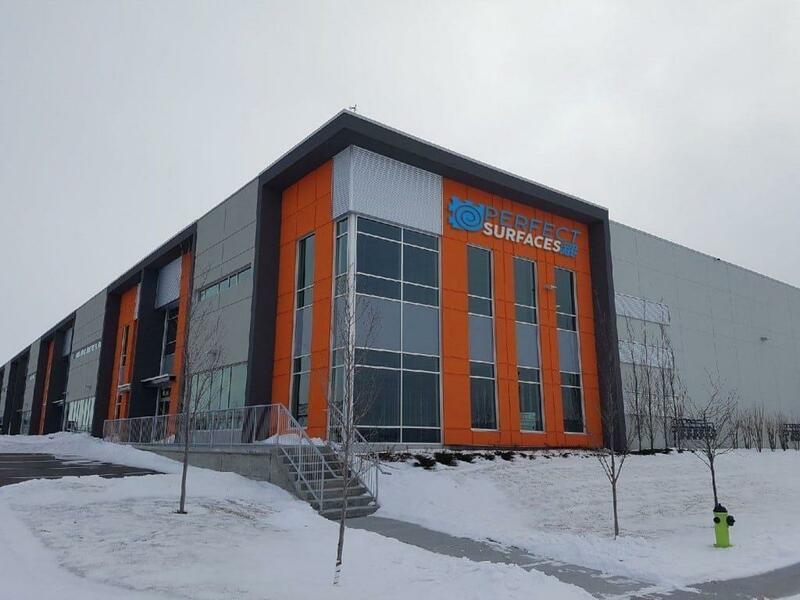 We saw a need in North America for superior rubber products on projects with unique flooring needs, and since 2008 we’ve filled that need. Having grown into a global industry leader, we now have many manufacturing facilities and shipping warehouses throughout Canada and the US. We pride our success on a balance of high-quality products, competitive prices, and excellent customer service. Perfect Surfaces provides many flooring options; from fitness and recreational flooring (i.e. 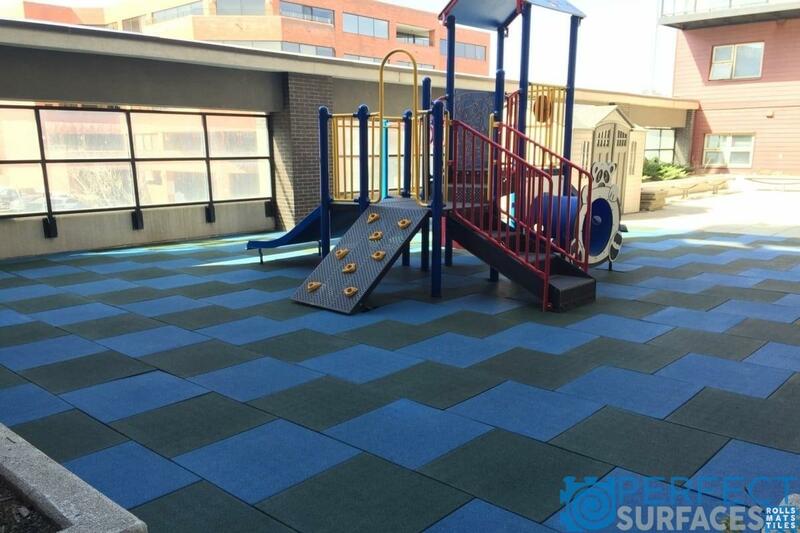 gym flooring, outdoor athletic, playground surfaces), to commercial and residential flooring (i.e. garage, basement floors, shopping mall tiles), to agriculture and industrial flooring (i.e. barns, stables, factories, manufacturing plants). In addition, we can also provide custom flooring options on request. With extensive manufacturing capabilities, Perfect Surfaces can offer its customers many product variations, thicknesses, colours, and much more so you can find the perfect product for your space. Our rubber flooring products have been tested and approved for high-traffic and high-impact areas; they provide a long-lasting, durable flooring solution. Also, our products install easily allow both business owners and home users DIY tools to complete their flooring projects themselves. Finally, all our floorings are environmentally friendly, drastically reducing the carbon footprint and the excess of old tires in our landfills. This high-impact, high-traffic, commercial gym needed a very durable, thick product to keep up with its busy clientele. This 6,000 sq./ft facility used Perfect Surfaces 3/8” Gator Rolled Rubber Flooring with a 17% speckle in yellow. 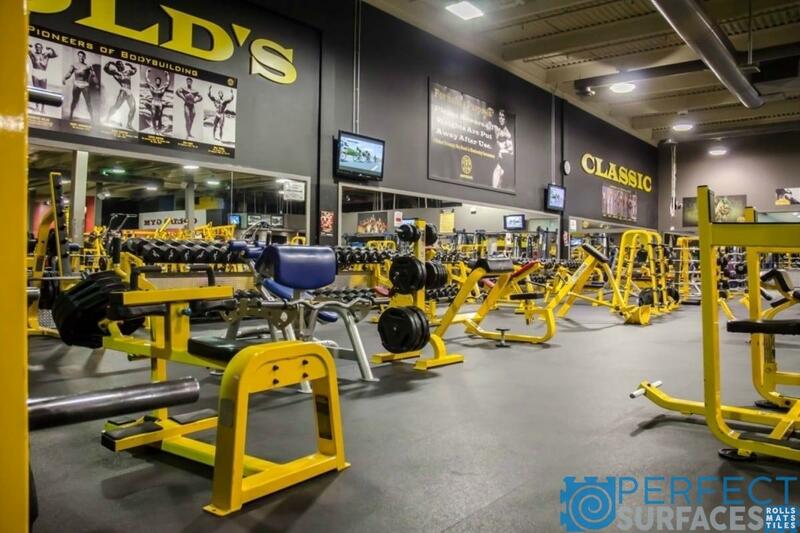 The 3/8” density was a great option for a large-scale commercial gym like Golds. It has the durability and support to withstand numerous pieces of equipment, and won’t fall apart with repeated use! The Scotiabank Saddledome is a namesake arena in the Calgary, AB area. This professional arena houses several professional franchises including the Calgary Flames hockey and Calgary Roughnecks lacrosse, Calgary’s WHL Junior hockey team the Calgary Hitmen, and many various concerts, exhibits, and shows. It was important to the client to install products that were exceptionally durable and could be used in many different applications. Perfect Surfaces recommended that the facility install the 3/8” Gator Rolled Rubber Flooring with 17% speckle in cocoa eggshell and red for the Calgary Hitmen dressing room and several other dressing rooms, and supplied the Saddledome with ½” Gator Rolled Rubber Flooring in black to withstand the heavy, condensed skate and foot traffic in the players boxes. This facility is outfitted with 1/4″ Gator Rolled Rubber (17% Blue/Grey speckled ). 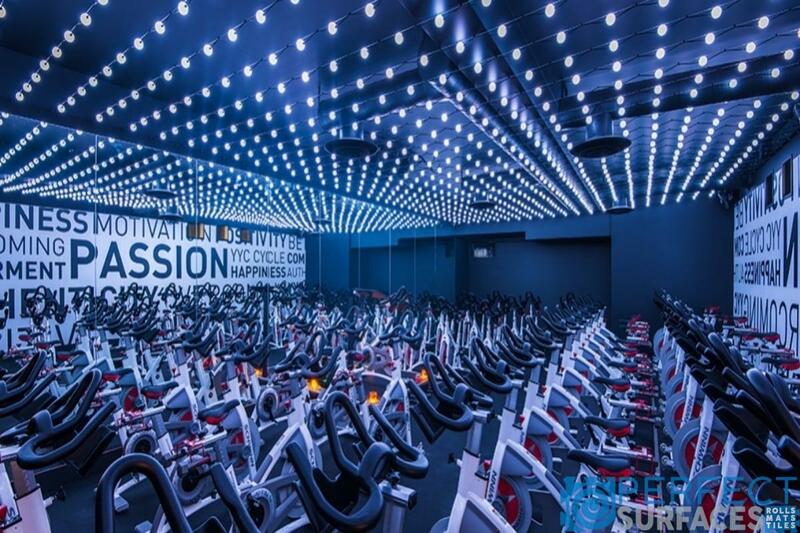 YYC Cycle began as a local Calgary spin studio and has quickly grown into one of Canada’s fastest growing spin studio franchises. The company now has five locations across Alberta and Perfect Surfaces is proud to have been the rubber flooring supplier for each studio. It was important to the client to have a durable yet economical product for their high-traffic studio spaces. Perfect Surfaces provided all 5 locations with our ¼” Gator Rolled Rubber Flooring, in the blue-grey 17% speckle. This facility is outfitted with 3/8″ Gator Rubber (17% Red speckled) and Agility elite turf with 5mm foam backing. UFC Gym® is the first major brand extension of the Ultimate Fighting Championship®, the world leader in mixed martial arts. In alliance with New Evolution Ventures™(NeV™), developers of many of the world’s most successful fitness brands, the UFC Gym brand gives UFC® enthusiasts and fitness seekers of all ages the opportunity to practice training techniques of famed UFC athletes. Offering a full-range of group fitness classes, private MMA training, personal and group dynamic training, plus MMA-style youth programming, UFC Gym creates something for all ages and fitness levels. As the first to combine mixed martial arts and fitness, UFC Gym has developed an atmosphere where members can see immediate results. UFC Gym is the ultimate fitness experience. The brand is not what you’d expect, yet more than you could imagine- always aiming to continue revolutionizing the fitness industry. 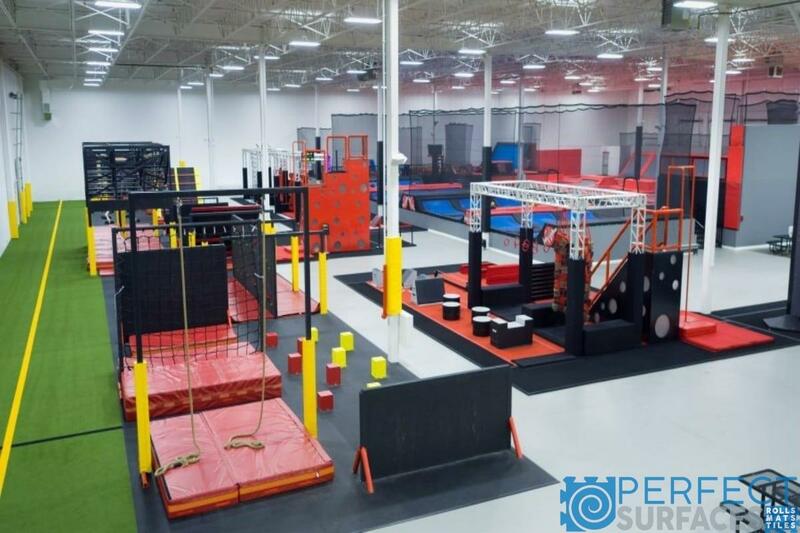 This enormous 55,000 sq./ft fun and fitness center boasts Ninja Warrior-themed obstacle courses, a military training course, a trampoline park, and much more. The center wanted to bring unique training techniques but didn’t want to dismiss the opportunity of creating a family-friendly space. This unique project needed an economical, yet durable, flooring solution for multiple spaces throughout the building. Perfect Surfaces provided the client with the Agility Swift Athletic Training Turf with 5mm Foam cushion, as well as the 3/8” Gator Rolled Rubber Flooring with a 17% speckle in grey. Canadians love their hockey, and what better way to showcase product than to have it featured in the Hockey Hall of Fame! Our client at the Hall of Fame was looking to recreate the Montreal Canadiens dressing room from the Montreal Forum, and approached Perfect Surfaces for the flooring. It was important to stick with colours that matched the original dressing room, while also using a product that could manage all the foot-traffic the Hall of Fame would entertain. Perfect Surfaces recommended using the 3/8” Gator Rolled Rubber Flooring with a 17% speckle in blue. 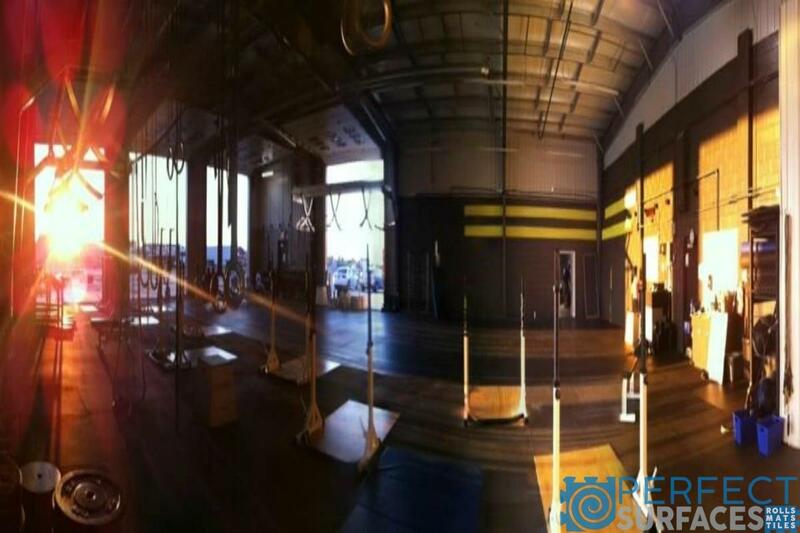 This expansive 10,000 sq./ft CrossFit Box in Winnipeg has everything from free weights, agility training, gymnastic equipment and much more! The client needed an extremely strong product that would be just as strong as the athletes that come to the gym. Perfect Surfaces provided CrossFit Winnipeg with the ¾” Black Gator Mats (4’ x 6’), as well as the Mighty Max Athletic Training Turf with 5mm Foam cushion for their agility space. These two products are built to withstand extreme conditions. Kids & Company is a well-established Canadian company specializing in daycare and early education, with several locations across the country. When kids and safety are of the utmost importance, Perfect Surfaces strives to provide the strongest and the most practical product to keep children safe. Perfect Surfaces provided KIDCO with both 1 ½” and 2 ½” Playsafe tiles. These two densities were applied in various locations throughout the playground space to give the best fall height protection to the areas that mattered most. 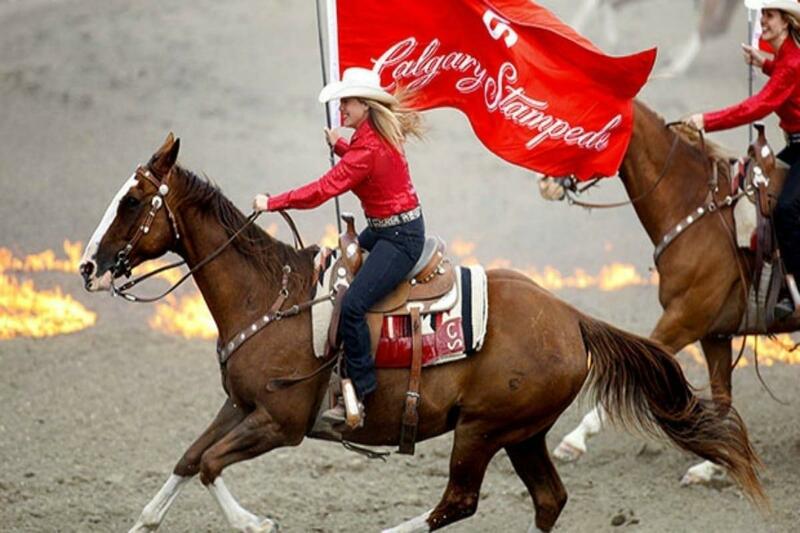 The Calgary Stampede is a not-for-profit organization that showcases and preserves Western culture, heritage, and events annually in Calgary, AB. The major event hosts large-scale agricultural events and recently required an upgraded flooring product in its barns. Perfect Surfaces was happy to provide the Stampede with several Tender Foot Rubber Stall mats in black. These thick sheets of rubber help alleviate fatigue, provide comfort, traction, and create a level surface, ensuring the animals were housed in comfortable conditions. The Alberta Junior Hockey team was looking to revamp their training facility and needed some extremely durable options for its athletes. Perfect Surfaces’ client came from a CrossFit background and understood that a tough surface created a tough athlete. 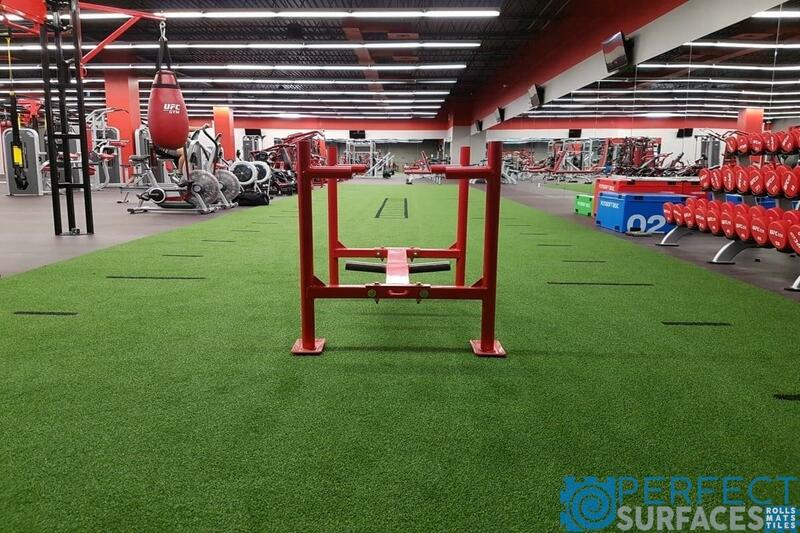 Perfect Surfaces was able to provide the Wolverines with 1” Ballistic rubber tiles in black and custom EPDM (ethylene propylene diene monomer) red tops to support the equipment and movement of the athletes; as well as with the Agility Swift Athletic Training turf with 5mm Foam cushion for the agility portion of this elite state of the art training facility. The Rogers K-Rock Centre, home of the Kingston Frontenacs OHL team, recently needed to resurface the team’s dressing room. With any space involving hockey skates, it is important to use a durable, long-lasting, and aesthetically pleasing product. 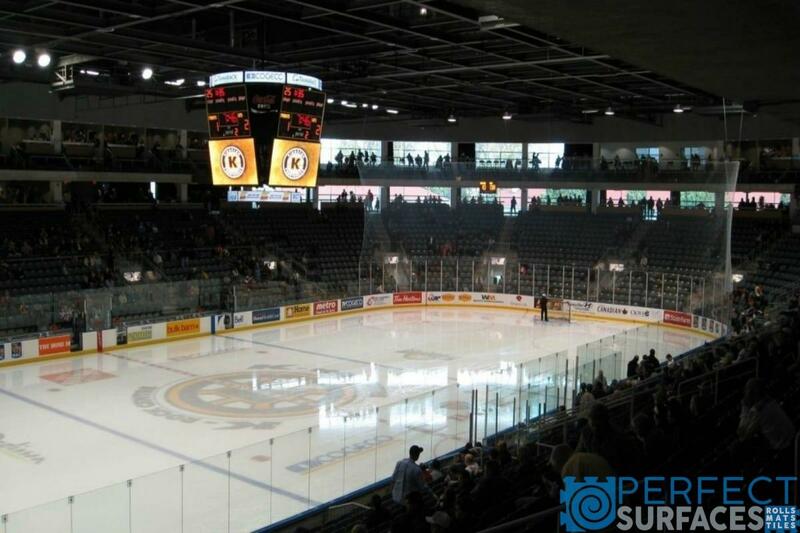 Perfect Surfaces was able to provide the Frontenacs hockey team with the ½” Gator Rolled Rubber Flooring with 17% speckle in yellow, to match the team’s colors. Perfect Surfaces recommends that any ice arena surface or dressing room surface be comprised of a product with a thicker density. This assists with the longevity of the surface and helps to support the athletes as they move over the surface. 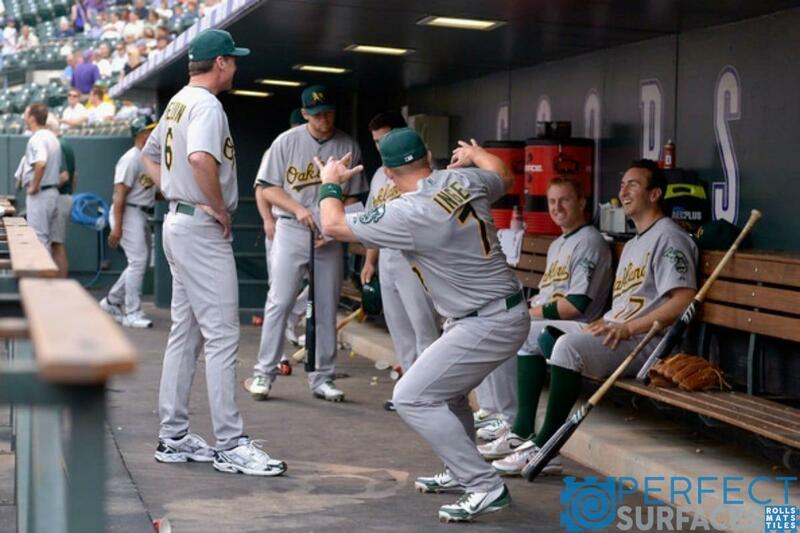 The Oakland Athletics MLB team was recently needed to resurface their dugout at their home field, the Oakland-Alameda Coliseum. The client wanted to upgrade its current surface to a product that could withstand the constant foot traffic – cleats included – that baseball dugouts experience. Perfect Surfaces provided the Oakland A’s franchise with the 3/8” Gator Universal Tile 17% speckle in green, to match the team’s home color. This product is often used in high-traffic retail, commercial, or industrial locations for its thicker density, however, this product is also suitable for outdoor use and is easy to clean. 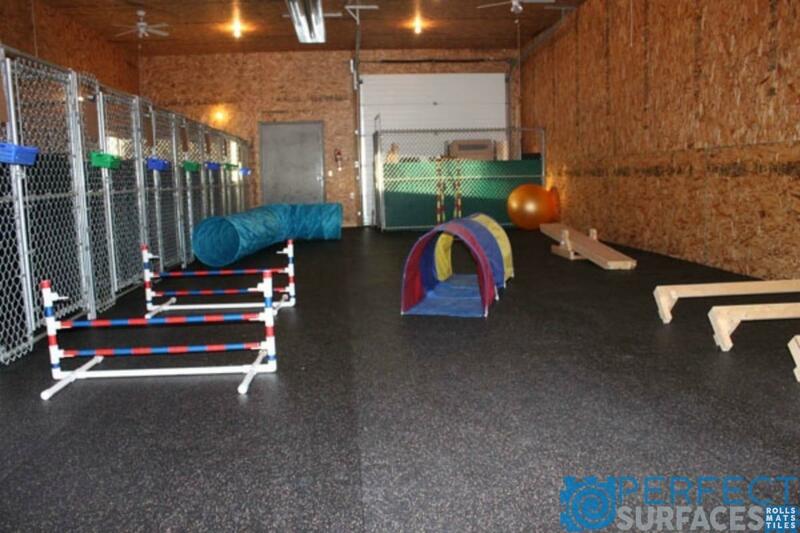 Sun Dog Kennels, located in Cochrane, Alberta, was looking to resurface their large indoor boarding facility. It was important to the client that the flooring be warm, comfortable, and long-lasting. With a high amount of foot traffic from both dogs and humans, the surface had to be durable and easy to clean. Perfect Surfaces supplied Sun Dog with the ¼” Gator Rolled Rubber Flooring with 17% speckle in cocoa eggshell. This color option was great for dog spaces, as the natural brown and cream flecks work to camouflage dust and dog hair. The density of the product was suitable for the high foot traffic but was able to fit in the smaller kennel spaces. Clever Canines Dog Training and Obedience facility required durable surfacing that could manage the high volume of foot traffic, and be suitable to clean up the mess that dog training can sometimes result in. It was important to find a product that had minimal seams and could be a comfortable and safe surface for training dogs of all sizes. 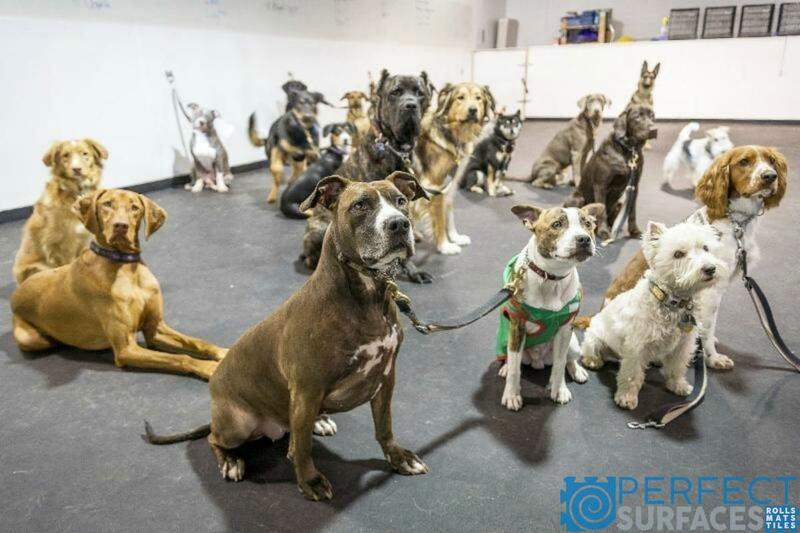 Perfect Surfaces was happy to provide Clever Canines with the 3/8” Gator Rolled Rubber Flooring in black. The comfortable, thick density flooring is durable enough to withstand the wear and tear of everyday dogs and human traffic and is also easy to install. This facility is outfitted with Agility elite turf with 5mm foam backing. 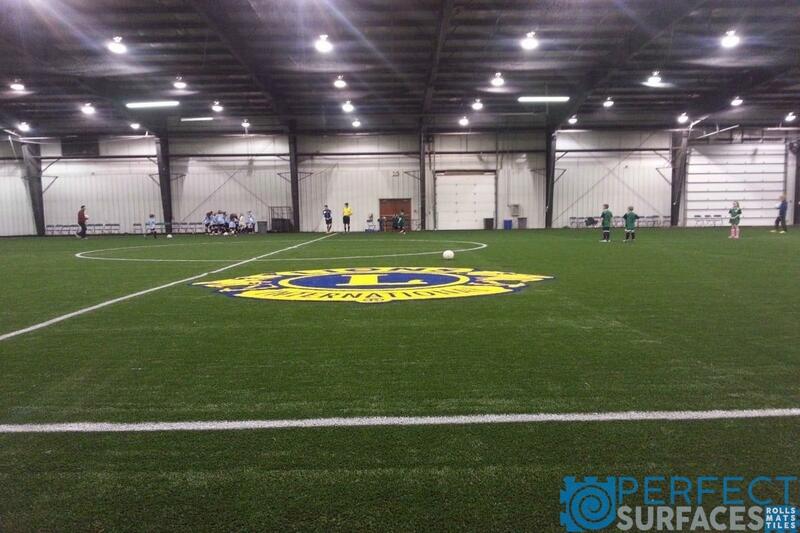 The Red Deer City Soccer Association, from Red Deer, Alberta, was looking to upgrade the flooring in their indoor soccer facilities. It was important to the clients that the artificial athletic turf was realistic, durable, and comfortable for the athletes to perform on. Perfect Surfaces was happy to provide two variations of athletic training turf. The first installment was completed with the Mighty Maxx artificial turf and the second installment was done with the Agility Swift. Both products are extremely durable, with short-pile heights and can be made with 5mm cushioning foam to provide superior comfort. 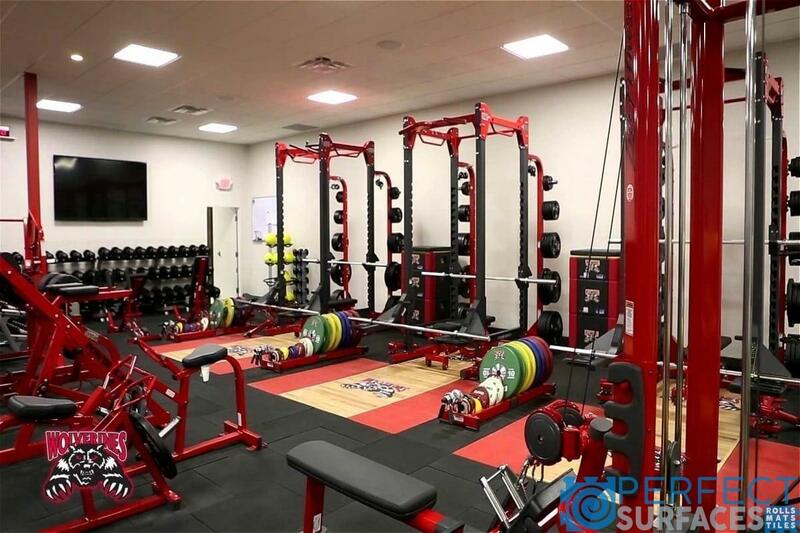 We know that indoor facilities require a product that provides maximum comfort and safety for its athletes; with either one of our athletic training options, you can easily upgrade your indoor facility or commercial gym.